Paper Monuments #012: Many performing artists at the Dew Drop Inn would become household names in the future world of Rock and Roll. The Dew Drop Inn "opened" its doors in 1939 under the ownership of Mr. Frank Pania. The Dew Drop would become a major player in the development of Rhythm and Blues. 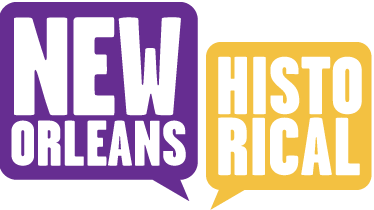 The "Drop," as it was called, became the hub of social and civic activities for New Orleans residents, regardless of race or gender. Mr. Pania had an "open door" policy and was respected by all. The Dew Drop offered its clientele much more than entertainment. It offered the Black community access to a nice hotel, a top-notch restaurant, as well as a barber and beauty salon. Many performing artists at the Dew Drop Inn would become household names in the future world of Rock and Roll. A young Ray Charles (nee Robinson) as well as Lil' Richard would not only live at the Drop but would record and perform there between 1953 and 1956. The Drop was skillfully managed by Patsy Valdez, who would become a close associate of Lil' Richard (of 'Tutti Frutti' fame), who would record 'Rip It Up' and 'Reddy Teddy' under the auspices of Robert 'Bumps' Blackwell of Specialty Records at the Dew Drop Inn. The stage would host the likes of Professor Longhair, Dave Bartholomew, Don Albert, The Neville Brothers, Johnny Adams and Big Joe Turner. During the middle to late 1960s, the go-go girls craze would explode at the Dew Drop Inn. Lil' Bea with her Boa would woo the crowd all night and was soon joined by "Pepper," the first Caucasian Go-Go Girl to appear in a black club. Ravaged by the aftermath of Hurricane Katrina, the building is still standing but has not been renovated. A rather sad position for a local historic icon that could serve as a beacon of success for our city and the world of music. 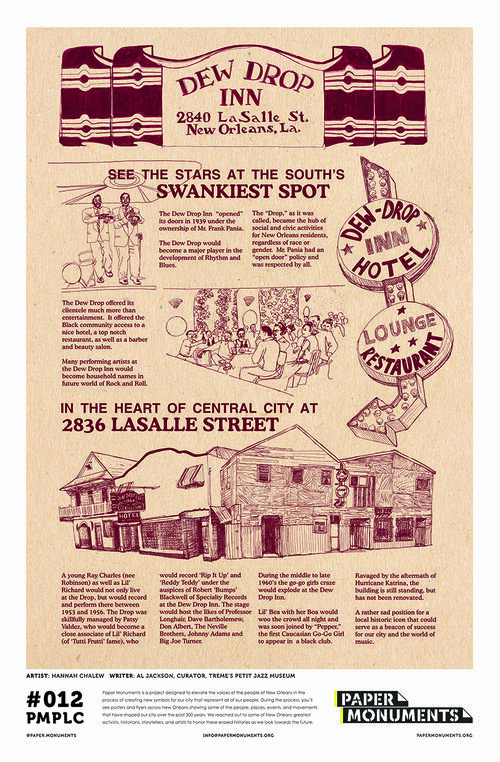 Paper Monuments, Hannah Chalew, Artist, and Al Jackson, Narrative, “Dew Drop Inn ,” New Orleans Historical, accessed April 19, 2019, https://neworleanshistorical.org/items/show/1432.